Hand Stitched Leather Coffee Mugs now up for sale! We've been busy building up our inventory of leather coffee mugs. Available in Black, Chestnut, and Chocolate Brown, each mug has a durable 9oz. latigo handle that is stronger than the competition, hands down. The included Mason jar holds 1 pint of your favorite beverage and is easily removed for cleaning. The insulating properties of leather are utilized to keep your hot drinks hot, and the cold ones cold. The aroma of leather with each sip just can't be beat! Available now in our General Store for just $35. Or, add one to your cart below! Like many of you, I have been consistently disappointed in the quality of folding chairs available today. Usually built of cheap, synthetic fabric and hollow metal tubes, it's rare that one can last more than two years. 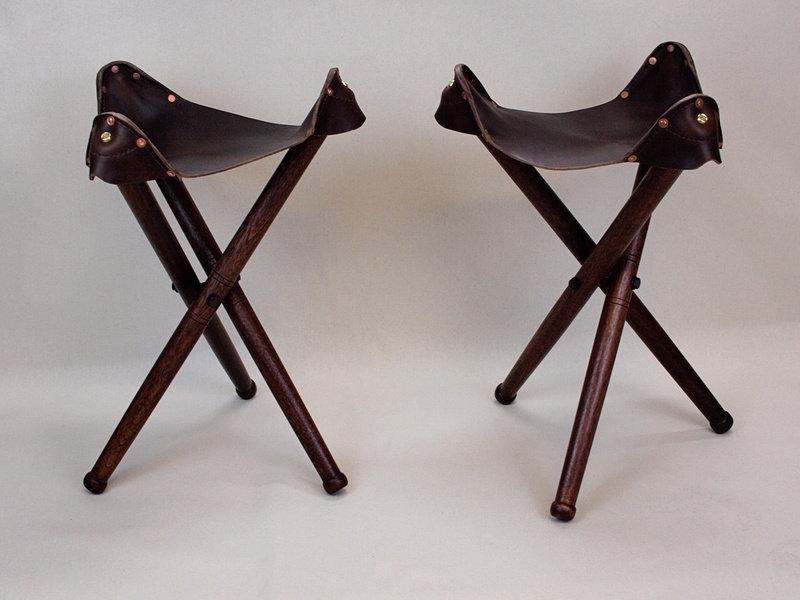 I've been on a quest for the perfect folding chair, and I think I've finally found it in the Campaign Stool. I was recently approached by a good friend and fellow woodworker, Todd Nebel, about collaborating together to make the Campaign Stool. He had a lathe (and mad woodworking skills), which I do not, and I had years of experience working leather, which he did not have. It was a perfect storm of skills brought together for one awesome project! Chris Schwarz recently brought this style back into popularity, and it's easy to see the benefits of this classic and sturdy design. 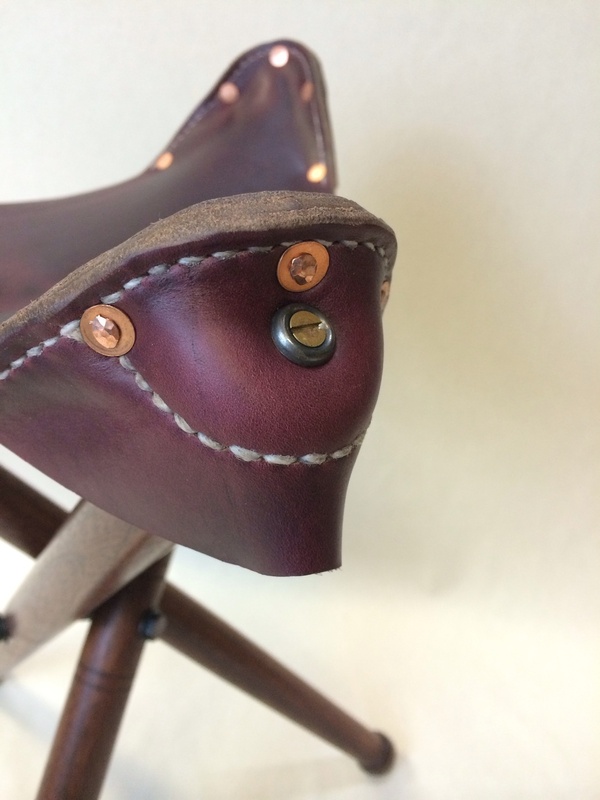 Utilizing a unique tri-bolt setup for the legs and a sturdy, yet comfortable leather seat, this stool has the potential to outlast it's mass produced, modern cousins many times over. After receiving the masterfully turned Mahogany legs and Tri-bolt hardware, I placed an order for some 7oz. Horween Chromexel leather. For those of you not familiar with this product, You are sorely missing out. This may be the nicest leather ever produced in the history of mankind. Soft, supple, strong, this leather has no equal. It was perfect for an application like this! The legs and hardware as I received them in the mail. Beautiful work!!! Chris Scwarz was generous enough to make templates for the seat available for anyone looking to make this stool. We changed one thing by adding a reinforced section in the leg "pocket". This provides an even stronger support for the seat, hopefully allowing the leather to last even longer with steady use. An extra piece of leather in the "cup" of the pocket reinforces the only potentially weak area of the seat construction. Most of the plans for Campaign Stools call for using rivets or stitching to secure the pockets. I decided to use both. I believe the combination of the two provides not only a near indestructible seat, it would provide some aesthetic appeal as well. Who said overkill can't look good, too? Hand stitched and riveted leather provides a near bulletproof pocket design. The hand stitching also anchors the additional pocket layer. 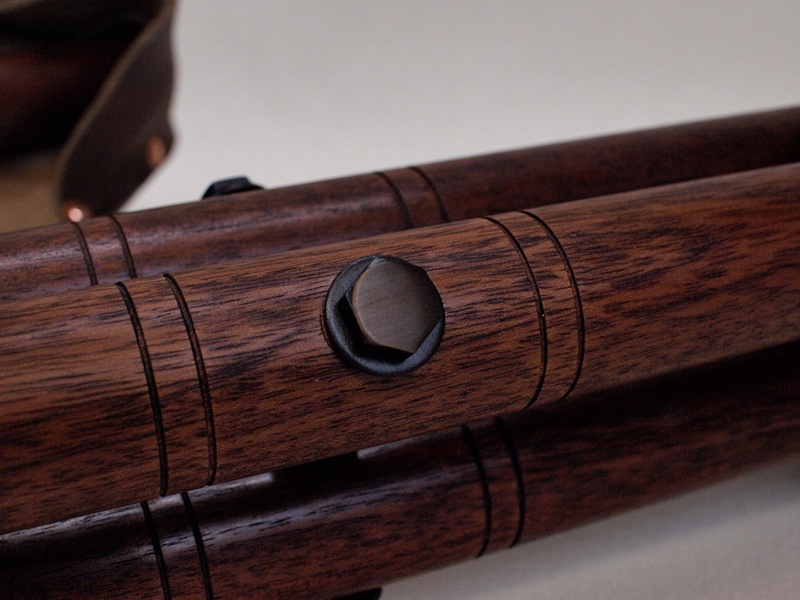 With the leather components assembled, I turned to the Tri-bolt hardware. I'm not the kind of guy who enjoys the look of hardware straight out of the bins at the big box store. If the rest of the project has been painstakingly gone over with a fine tooth comb to ensure all of the details mesh well together, why throw stock hardware in the mix?? Using a smooth mill file, I went over every flat surface on the tri-bolts until all edges were smooth and free of defects. A light sanding with 320-grit sandpaper preps the surface for the same Flax Oil finish that adorns my Moxon Vise hardware. The results blend well with the mahogany legs and leather seats. Overall, the Campaign Stools have been a joy to use. They fold up and are easy to transport. Campaign Stool folded up and ready to go!